Let’s imagine you approach a T-junction on an average 30 mph road and you intend to emerge right. On approach check your rear view mirror and right door mirror to check the speed and position of following traffic. 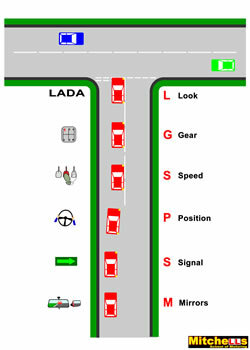 Think about where you will apply your right signal. Ensure there are no other junctions or major openings on the right before the junction as your signal may give the impression you are turning into one of them. If so, delay the signal until you have passed them. Position as close to the centre line as safe. Look for other vehicles parked and make sure there is enough space for another car turning in to pass. on a narrow road the position maybe to the left. Keep your wheels straight. Do Not turn to the right. This could cause a collision if for example someone is turning righ into the road. Brake progressively on approach to the junction so your speed reduces gradually to avoid harsh braking when nearing the line. There is no need to change down through the gears. Imagine you have approached in 4th gear and brought the speed down gradually, at a certain point approx 15-20 mph (before the car starts jumping because you are in too high a gear) you will need to dip the clutch, (this will be sooner in a diesel car than a petrol due to the different gearing). On a closed junction or any junction with a limited view it’s probably best to use first gear to emerge (most t-junctions fall into this category) and creep the car on approach to the give way line. Remember you MUST stop at a stop line even if the road appears clear. There is no need to apply the handbrake, however you must make it a stop. It is usally best to stay in the gear you are in until you stop, then change the gear, then Look. On a junction with neither a give way or stop line you still give way, the road across the top of the ‘T’ has priority even without any marking. You should start your observations on the approach to a junction as early as you can see into the new road. Your minimum observations at a t-junction are right - left - right - left again before crossing a give way /stop line / end of kerb line. Look to the left for cars approaching. you must be able to get out and upto speed without causing a car to slow down or cange position. When looking right you will obviously give way to traffic, but if someone approaches with a left signal to turn into your road and they are close enough to hit you should their signal be wrong then wait. Once you see a second sign such as the car slowing heavily or the car actually starting to turn then you will know for sure that it is then safe. If the vehicle is large such as a bus or lorry, be aware of vehicles behind it that are obscured from your view. They may try and overtake the turning vehicle, and you would be in danger if you are in the process of emerging. If you can’t see then don’t go. Check right door mirror just before moving away for cyclists and pedestrians, this is particularly important in slow queuing traffic. Remember to check interior mirror when entering new road, to see what may have changed behind you.